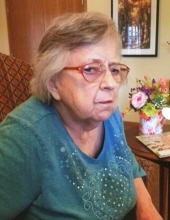 Age 83 of Brant passed away on Wednesday, April 10, 2019 at Brookdale Saginaw Assisted Living. A funeral service will be held at 1:00pm on Friday, April 12, 2019 at Nelson-House Funeral Homes Martin Chapel. Burial will follow at Marion Township Cemetery. The family will receive friends that day from 11:00am until the service. Beverly was born on September 5, 1935 to Carl and Julia (Attenberger) Federspiel in Marion Township. She graduated from Merrill High School, and she worked as a Forklift Operator for MagnaTech for 45. During her life, Beverly loved hunting deer, fishing, and traveling across the United States. She was also a master wood carver, and she enjoyed going out to eat with friends and family. Beverly is survived by her sister, Patricia (Gorman) Wolfe; her brothers, John Federspiel and Robert (Patricia) Federspiel; as well as many nieces and nephews, great-nieces and nephews, and great-great-nieces and nephews. She is predeceased by her father, Carl; her beloved mother, Julia; her hunting partner and brother, Thomas; and her oldest brother, Carl Jr.; and her sister-in-law, Roberta. Memorial contributions are suggested to Alzheimer's Association - Team Beverly or Marion Springs Fire Fund. The family would like to thank the caring staff of Brookdale for the excellent care they gave to Beverly. To send flowers or a remembrance gift to the family of Beverly Jane Federspiel, please visit our Tribute Store. "Email Address" would like to share the life celebration of Beverly Jane Federspiel. Click on the "link" to go to share a favorite memory or leave a condolence message for the family.